The Jagannath Temple is a famous Hindu temple dedicated to Jagannath (Vishnu Bhagwan) and located in Puri in India. The name Jagannath (Means of Universe) is a combination of the Sanskrit words Jagat and Nath .The temple is an important pilgrimage in the Hindu culture, being a part of the Char Dham pilgrimage that a Hindu has to visit atleast once in a lifetime. The central forms of Jagannath, Balabhadra and the goddess Subhadra, their sister, constitutes the trinity of deities sitting on the bejewelled platform or the Ratnavedi in the inner sanctum.The deities of Jagannath, Balabhadra, Subhadra and Sudarshan Chakra are made from sacred Neem logs known as Daru Bramha. Depending on the season, the deities are adorned in different garbs and jewels. 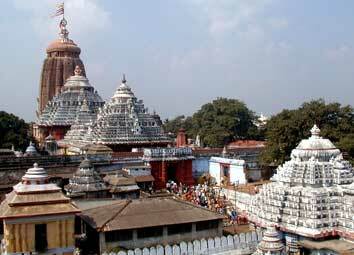 It is a very renowned temple and is one of the biggest temples of Orissa. It is the supreme solace of the countless devotees sround the world. It is one of the four major Dhamas in India.